Watching sports on live television allows you to be a spectator in real time without having to buy an overpriced ticket, sit in a claustrophobically packed crowd, or smell a stranger's potent hot dog farts. Plus, if your favorite team or athlete loses, you can sob uncontrollably in the privacy of your home unless you went to a bar or friend's house, in which case, just cry in the bathroom. Granted, some people might enjoy crying in front of others, and flatulence still stinks even if you know the person delivering it, but if something utterly nutty happens, nothing beats seeing it on TV. TV adds a special layer of madness to an already crazy sports moment. After all, pro athletes regularly stretch the limits of what seems humanly possible, and television warps reality. Combine those things with an outrageous act or unlikely event, and it feels like you're having a lucid dream about watching sweaty people. Best of all, you'll get to see the craziness from a cool camera angle while hearing the stunned befuddlement of commentators. Here are some unreal sports moments that made us disbelieve our eyes. When you truly love someone, you'll move heaven and earth to show them how much you care. The same thing happens when you love a sports team, except it's creepier since you probably don't know the players personally. Nevertheless, a dramatic fan gesture can be insanely sweet, or at least insane. Mike Sergio loved the New York Mets so much that he didn't just move heaven and earth; he moved from earth to heaven and back down to earth to show his support. Sergio was no ordinary fan. As Sports Illustrated explained, he was a rock musician, construction worker, soap opera actor, and amateur skydiver. This was a man who knew how to make a dramatic entrance, and during the 1986 World Series he did just that. The Mets had just lost Game 5 to the Boston Red Sox, and Sergio decided to cheer his team on in the most scene-stealing way imaginable. With the aid of an accomplice Sergio parachuted into Shea Stadium with a banner reading "Go Mets." Spectators and players alike went wild, and Sergio went to jail. The 1994 NBA Finals has often been called the "Forgotten Finals," which is a super ironic way to be remembered. Of course, the series wasn't completely wiped from our memory banks. We'll never forget the clutch shooting by whatshisname who played for the um — actually, let's just see what CBS Sports recalled. Oh! That was the O.J. Simpson Finals. In case you also forgot, in 1994 the Houston Rockets, led by Hakeem the "Dream" Olajuwon, squared off against Patrick Ewing and his New York Knicks for the NBA title. On paper it was an awesome match-up between two of basketball's most towering figures. On TV it was a stale meh sandwich defined by a "hard-knuckle, unappealing style of play." However, things finally turned exciting in Game 5 because a dude named after a breakfast drink led police on a low-speed chase. As the LA Times detailed, police had charged O.J. with the slayings of his ex-wife Nicole Brown Simpson and her friend Ron Goldman. He was supposed to turn himself in but instead jumped into his now-infamous white Bronco with his buddy Al Cowlings and fled at an almost leisurely pace. Watching an NFL Hall of Famer lazily evade capture was apparently more exciting than whatever the Rockets and Knicks were doing, so the game was relegated to a small box in the corner of people's television screens. Flopping is the sports equivalent of faking pleasure in the bedroom — just a bunch of people lying down and pretending to feel something. However, in 1989 Roberto Rojas took it entirely too far. Rojas was the goalkeeper for Chile in a decisive World Cup qualifying match against Brazil, and thanks to him, Brazil's hopes of advancing almost literally went up in smoke. As CNN recounted, Chile was down 1-0 with 20 minutes remaining in the game. After Brazil's keeper punted the ball downfield, Rojas was spotted on the on the ground with his hands over his face as smoke envelops him. Lying nearby was a lit flare. Rojas' crimson-shirted teammates carried him off the field as blood poured from his head. At that point the match effectively ended. Not one TV camera caught the moment when the flare landed. However, it originated from the Brazil section of the stadium, implying that someone attacked Rojas on Brazil's behalf. Without proof to the contrary, Chile would win by disqualification. Thankfully, a photographer had captured the flare's progression. It never came close to touching Rojas. The goalkeeper had faked an attack on himself to get Brazil disqualified. (The blood came from self-inflicted razor wounds.) The dastardly plot got Chile barred from the 1994 World Cup. Mike Tyson was the type of boxer who wanted to eat his opponents (or their children) alive, and in 1997 he almost succeeded. It all went down during the hotly anticipated sequel to his 1996 showdown with Evander Holyfield, which Tyson lost in the 11th round. Almost 1.9 million people tuned in to Showtime to watch the "Baddest Man on the Planet" try to even the score with the "Real Deal." What followed was 1,000 straitjackets' worth of crazy. As ESPN described, in Round 2 Tyson sustained a gash over his right eye after receiving what he considered intentional headbutts from Holyfield. 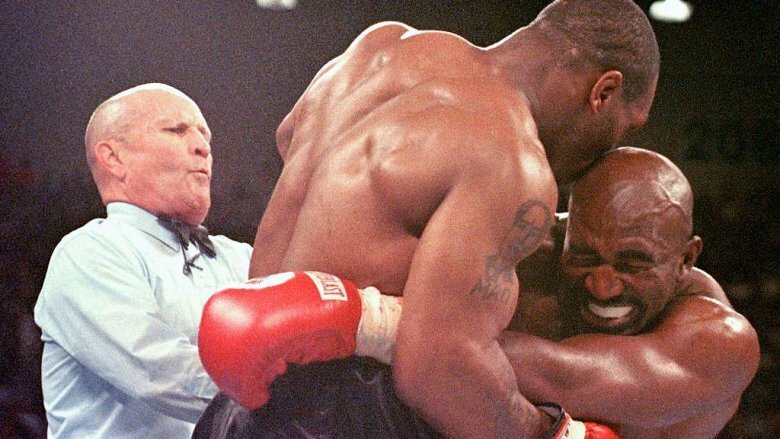 Per the above video, early in Round 3 referee Mills Lane gave Holyfield an earful for landing a low blow. Tyson, already incensed about the headbutting, soon gave Holyfield an earful of teeth. The Real Deal hopped with pained disbelief after having a chunk of his right ear dentally removed. Shockingly, the fight was allowed to continue, and Tyson bit Holyfield's left ear, triggering a much-deserved disqualification. Tyson received a $3 million fine, an 18-month boxing ban, and a $30 million payday. He later appeared opposite Holyfield in a Foot Locker commercial that features him apologetically returning the ear. Regardless of what the ump says, nothing in baseball is safe. The ball is a leathery white missile that can vaporize birds on impact, fans can get shot in the face by weirdly Freudian hot dog cannons, and someone's bound to get a splinter from one of those wooden bats. Not even the earth itself was safe during the 1989 World Series. On October, 17, 1989, ABC began airing what should have been Game 3 of the championship slugathon between the Oakland Athletics and the San Francisco Giants. As the teams prepared to play ball at Candlestick Park, the Earth began violently hiccupping. According to Giants pitcher Mike Krukow, "it felt like a 600-pound gopher had rolled in from behind the right-field fence." That morbidly obese gopher was actually a lethal 6.9-magnitude earthquake. The quake hit just as the Giants were heading to the field for introductions. Television viewers were greeted with flickering screens and uncertainty as audibly concerned announcer Al Michaels declared, "I'll tell you what … we're having an earth …" before the transmission cut off entirely. The disaster lasted less than 20 seconds but caused over $6 billion in damage and claimed 63 lives. Candlestick Park withstood the tremor and served as one of the few sources of live news updates in the city. NBA legend Shaquille O'Neal was a special kind of huge. The 7-foot-1 center resembled an oversized redwood tree on the court. Even Charles Barkley said, "I played in the NBA for 16 years; Shaquille O'Neal is the only guy that I ever said, wow that's a big dude." And how could he not feel that way? The first time they played against each other, Shaq attacked a basket so hard that it died. The basket massacre happened in 1993 when Shaq was an NBA rookie with something to prove. During a nationally televised match-up between his Orlando Magic and Charles Barkley's Phoenix Suns, Shaq made a thunderous dunk that caused the entire basket to collapse. According to the Orlando Sentinel, incredulous viewers accused the NBA and NBC (which broadcast the contest) of rigging the basket to fall. In reality, Shaq was just freakishly beefy. In fact, later that year he ripped a backboard off the basket. The NBA was ill-equipped to handle his gargantuan strength and had to create Shaq-proof backboards. Super Bowl XLVIII had the rare distinction of not involving Bill Belichick. To call it a competition would be a stretch. The Denver Broncos got trampled by the Seattle Seahawks, who won 43-8. The MVP of the game was Seahawks linebacker Malcolm Smith, who had nine tackles, a recovered fumble, and an interception returned for a touchdown. Though he probably hurt his hand spanking Broncos all night, Smith couldn't believe he received the honor. Even less believable was what took place during his postgame interview. As Smith was describing how he didn't expect to be named MVP, a random dude jumped beside him, snatched the mic, and started to rant about America's worst terrorist attack. Speaking with the intensity of an auctioneer on crack he uttered, "Investigate 9/11. 9/11 was perpetrated by people within our own government." Once the strange man got removed, Smith, using a low-key WTF voice, asked if everyone was okay. True Jersey identified the interview crasher as "independent journalist" Matthew Mills. Amazingly, Mills outsmarted security by wearing an old festival badge that he passed off as press credentials. All he had to do to gain access was board an employee bus and act like he belonged, which sounds even crazier than his rant. John McEnroe was a great tennis player and an even greater man-child. Whenever he didn't get his way on the court he would pout, shout, and wave his racket like an extremely large baby rattle. His theatrical unprofessionalism was infectious, so it's no surprise that his most epic tennis tantrum coincided with one of the most inappropriate displays of reporting in sports history. At the 1981 Wimbledon tournament McEnroe was a man-toddler going through his terrible 22s. As the Washington Post described, he whined about everything — the officiating, the weather, and even the grass. Before he even swatted his first ball he declared, "There's nothing championship about this tournament except its prestige." He wasn't the only person with harsh words to share, though. During an especially testy press conference, McEnroe was hit below the belt with a question about his love life. According to the Independent, the public had been speculating about whether McEnroe and his girlfriend broke up, so tennis writer Nigel Clarke popped the question. The already-surly McEnroe took offense as did Charlie Steiner, an American reporter who had forced his way into the event. Steiner laid into Clarke, and the two came to blows. Clarke would later recall standing on a chair and raining punches down on Steiner. The NBA has seen more than its fair share of off-the-wall characters. 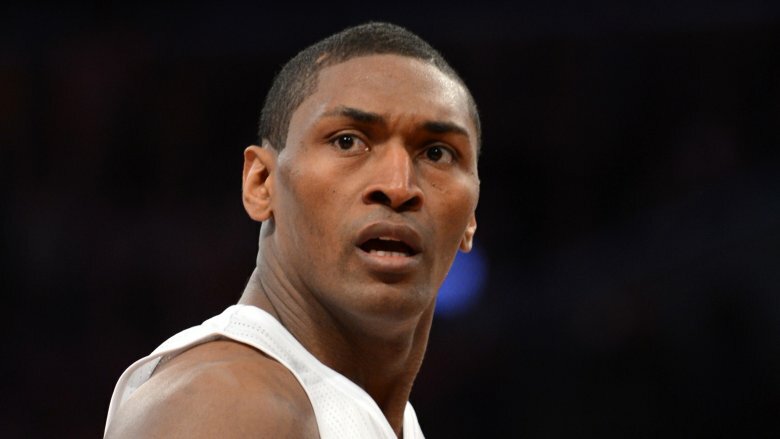 Among those odd ballers was Ron Artest, who now goes by Metta World Peace. A cursory glance at his basketball past will make you think his new name is a meta-joke. Back when he was an Indiana Pacer, the Artest formerly known as Ron was about as peaceful as the Thunderdome. The most striking example of his violence was the "Malice at the Palace." In 2004 the Palace of Auburn Hills became the site of a royal rumble between the Detroit Pistons and the Indiana Pacers. As detailed by Click on Detroit, the Pacers had a commanding 15-point lead with 45 seconds left in the game. However, Pistons player Ben Wallace refused to go down without a fight. After getting fouled by Ron Artest, Wallace retaliated with a ferocious shove. Officials and players quickly stepped in to prevent a fistfight, but Pistons fan John Green reignited the fighting by chucking his beer at Artest. An enraged Artest lunged at the crowd, and two of his teammates entered the fray. Foolhardy fans engaged the Pacers in battle as other spectators hurled trash through the air. The entire debacle aired on a nationwide ESPN broadcast, which was a huge black eye for the NBA. In response the league slapped Artest with an 86-game suspension. In 1998 Pittsburgh Pirates outfielder Turner Ward broke one of baseball's major barriers: a fiberglass outfield wall at Three Rivers Stadium. No one thought he would do it, not even Ward, who told Trib Live, "You never thought you could break through it." His only focus was intercepting a line drive hit by Mike Piazza of the LA Dodgers. In his mind he "could hit the wall as hard as [he] wanted to" because it had padding. Despite sustaining cuts and bruises, the outfielder felt more sympathy for his inanimate victim. In a post-game interview he remarked, "Well, I sure feel like I hit a wall, but I think I'm in better shape than that wall is." He didn't mind being a one-man wrecking crew since the stadium was scheduled to be demolished, anyway. The thing that really struck Ward was his ability to hold onto that ball. The Super Bowl halftime show is the most entertaining pee break in all of sports. World-famous musicians give dazzlingly elaborate performances while TV viewers rush to empty their overloaded bladders. There have been plenty of memorable shows over the years, but few have garnered more attention than the 2004 duet by Janet Jackson and Justin Timberlake. Even if you didn't already know, you can probably guess that the New England Patriots played in that Super Bowl and won. But the entire game was overshadowed by an impromptu anatomy lesson. During halftime Jackson and Timberlake did a rendition of "Rock Your Body," which concludes with the line, "Gonna have you naked by the end of this song." At the end of the song Timberlake removed the fabric from Jackson's chest, thus fulfilling the musical prophecy. Jackson's lady lump was visible for less than a second, per USA Today, and both she and Timberlake insisted the whole thing was a "wardrobe malfunction." Regardless, fuddy-duddies everywhere were furious. CBS, which broadcast the Super Bowl, got slapped with a $55,000 fine which was later overturned. A Tennessee woman filed a class-action lawsuit against the singers, CBS, and CBS' parent company, claiming that she along with millions of viewers endured "outrage, anger, embarrassment and serious injury." She eventually dropped her case.